If you’re visiting this site, it’s highly likely that you’re either thinking of becoming, or you already are, a writer. When, though, does that transition happen? When do you get to drop the “aspiring” from your title as “aspiring writer?” Anyone along the writing career spectrum, from those just toying with the idea to those fully immersed in writing every day, will deal with this question at some point: When can you call yourself a writer? It’s not always easy to tell when you make the leap from thinking to doing, from training to being, from practicing to performing. But there are some milestones along the way that can help you figure out when to openly admit to officially being a writer. Here are four ways to tell if it’s time to start calling yourself a writer. This first marker is pretty obvious. For fun or professionally, if you spend a good chunk of your day putting words on a page–whether blogging, writing print or online articles, penning short stories, or drafting your first (or fifth) novel–you are a writer. The great thing about being a writer is that you can be a slasher. You might be a writer/administrative assistant. Or a writer/nurse. Or a writer/teacher/bartender/yoga instructor. Writers are often slashers, but you should feel comfortable calling yourself a writer if you spend time on it every day. You see stories in everyday life. How many times a week do you talk to someone, or observe people, and think, “there’s a story there somewhere” or “that would make a great novel!”? Whether you’re into fiction or nonfiction, long or short form, these moments happen to writers all the time. Give yourself bonus points if you’ve started carrying around a pen and pad (or have a special notes app on your smartphone) to write down these story ideas when you think of them. You apply for writing jobs. I’d already been blogging part-time for about two years when I decided to “become a writer” and leave my regular job to try writing full-time. (It didn’t occur to me that the time that I was already being paid to write!) I started looking for freelance writing jobs, and eventually was hired. There it was, in my job title–”Writer.” And yet, it still took me about one more year, and a LOT more writing, before it felt like I was officially a writer. You doubt yourself constantly, but you keep writing. 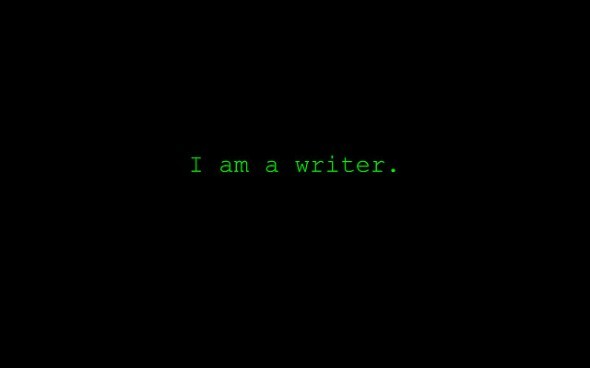 I now manage a team of writers in addition to doing my own writing and sometimes I still need to remind myself that I am a writer. When I meet writers who’ve been published by bigger outlets, or who’ve written novels (something I have no interest in–I’m definitely a short-form writer), sometimes it still feels like I’m masquerading as a writer. Like I’ve slipped into a club I shouldn’t really be a part of. But despite the doubt, the second-guessing, and the lack of confidence, I keep writing because I enjoy it and I’m not sure what on earth I’d do with my time otherwise. And that’s how I know I’m a writer.